INDIANAPOLIS, IND. (November 16, 2017) — Klipsch®, a tech-driven audio company and wholly-owned subsidiary of VOXX International Corporation (NADAQ: VOXX), today announces Reference Premiere™ Designer On-Wall speakers that compliment modern day flat panel TVs, occupying minimal space and delivering enhanced sound. 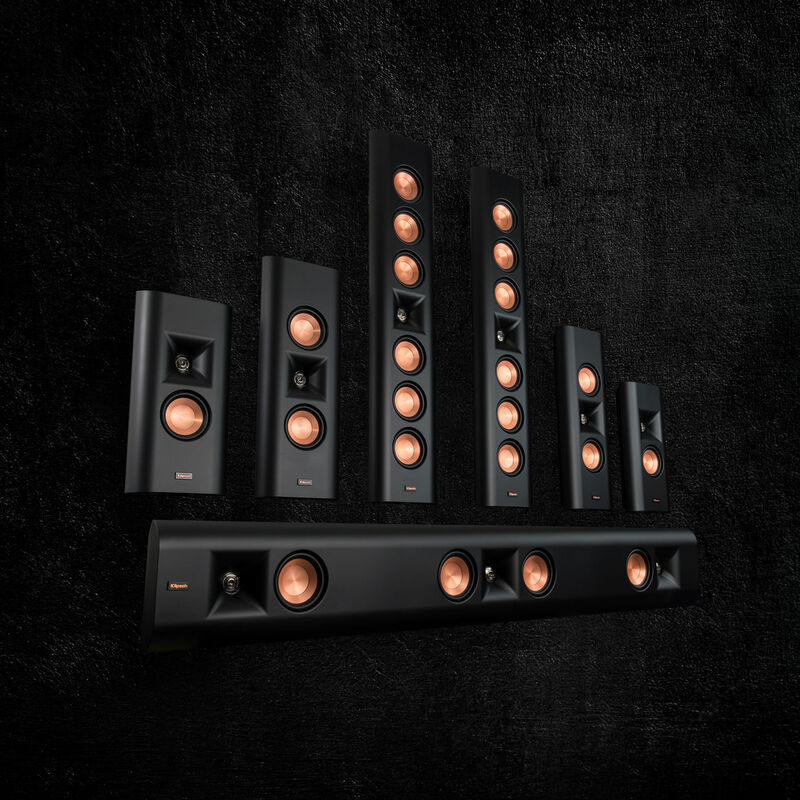 Engineered for the ultimate sound experience, the on-wall speakers capture the same distinct power, detail and emotion of Klipsch’s renowned Reference Premiere horn-loaded home theater speakers. Klipsch Reference Premiere Designer On-Wall speakers are an incredibly versatile solution that bring the highly-acclaimed Reference Premiere acoustic technologies to a slim, on-wall solution. Equipped with four-way keyholes for horizontal or vertical wall mounting, each speaker also includes an elegant glass base which can be attached for placement on a tabletop or bookshelf – also giving the option of horizontal or vertical orientation. Smooth lines and ultra-slim cabinets closely match today’s thin bezel TVs, while the matte black painted finish integrates them seamlessly into today's modern interior designs. This series incorporates the legendary acoustics, premium materials, and advanced technology as the award-winning Reference Premiere home theater speakers. Exclusive Tractrix® Horn technology improves high-frequency response and extension, while enhancing imaging and dynamics. A Linear Travel Suspension titanium tweeter maximizes dynamics for detailed performances. Klipsch signature copper Cerametallic™ woofers minimize distortion while providing one of the highest efficiency ratings in the class. “We created Klipsch Reference Premiere Designer On-Wall speakers to bring the dynamics, detail, and power of our critically acclaimed Reference Premiere box speakers in slim on-wall solution - for attractive, elegant and décor-friendly performance,” said Michael Buratto, product manager for Klipsch Group, Inc.
Klipsch Designer On-Wall speaker series is available now through professional integrators. Learn more at Klipsch.com/custom. In 1946 Paul W. Klipsch, inventor, acoustics pioneer and maverick, founded Klipsch Audio with the sole purpose of bringing the power, detail and emotion of the live music experience into his living room. >span class="TextRun SCXW120139781" xml:lang="EN-US" lang="EN-US"> highly efficient speaker designs, handcrafted cabinetry and a thirst for real engineering breakthroughs – Klipsch, the great American loudspeaker company, was born in Hope, AR. Today, our diverse range of quality audio products includes speakers and headphones for almost any consumer and professional application – including cinema, whole-house, wireless, home theater and portable offerings. Honoring our founder’s legacy, Klipsch continues to be the legendary high-performance brand of choice for audiophiles and aficionados around the world. We are the Keepers of the Sound®. Klipsch Group, Inc. is a VOXX International Company (NASDAQ: VOXX).